Edward Jenkin (or possibly Jenkins or sometimes even Jenkyn) Prest (1857-1934) was born in Cornwall, his birth registered in Launceston. He must have spent some time in the Middlesex area, where his marriage was registered in Edmonton in 1880. but in 1883 he joined the stained glass firm of Shrigley and Hunt in Lancaster, first as a draughtsman, and then from 1891 as a manager. His name crops up in the local newspaper in Lancaster several times, in connection with amateur dramatics and choral performances. But in 1901, the census shows him to have been living in Haverstock Hill, Hampstead. At this time there was a notice in The Tablet of the unveiling of a particularly beautiful window executed by him in Bermondsey, in the chancel of the Church of the Most Holy Trinity, confirming this London address (this five-light window was blown out during the war, and replaced). He is also reported to have had business premises or a workshop at Craven Street, Charing Cross; but apparently by 1907 he was trying to return to Shrigley and Hunt (see "Architects and Artists"). Later he joined the office of John Hall and Co. in Bristol. 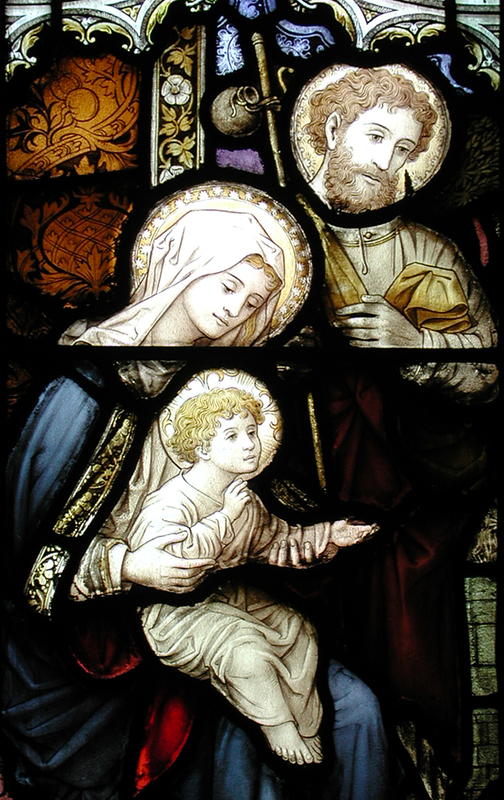 Little is known about these later years, although (for example) there is a window by him in St Mark's, Bourne End, in Buckinghamshire, dated 1915, showing that he was still in the business then (Pevsner and Williamson 186). Indeed, he is listed as a Fellow of the British Society of Master Glass Makers, founded in 1921, in the index to Volume 1 of their journal. His death was registered in Staines, then in Middlesex, in 1834. He was 77 years old. — Jacqueline Banerjee. "Architects and Artists P-Q." Sussex Parish Churches. Web. 8 October 2016. Free BMD. Web. 8 October 2016. "The Musical and Dramatic Performances." The Lancaster Gazette and General Advertiser for Lancashire, Westmorland, and Yorkshire, 3 January 1883. Issue 5306. British Library Newspapers, Part II: 1800-1900. Web. 8 October 2016. Index to Volume I. Journal of the British Society of Master Glass Makers. Web. 8 October 2016. Pevsner, Nikolaus, and Elizabeth Williamson, with Geoffrey K. Brandwood. Buckinghamshire (Buildings of England series). London: Penguin, 2nd ed. 1994. "News from the Dioceses," 4 May 1901. The Tablet. Web. 8 October 2016.